Q: My husband and I are planning our first cruise, and we thought we’d start with a river trip. But they all seem pretty expensive compared with ocean cruises. Why is this? A: At first glance they do look pricey, but like most things in life you get what you pay for. The main thing to remember is that you’re not comparing like with like. Many ocean lines tempt people on board with low fares that include your cabin and food in the main dining room but not much else. River cruises include a lot more, with few extras and sometimes none at all. With the likes of Viking, Avalon, Emerald and AmaWaterways, your fare will cover daily shore excursions (often with a choice of three or more), as well as wine, beer and soft drinks with lunch and dinner, plus 24-hour tea and coffee, bottled water and wi-fi. And when you buy a drink at the bar, you only pay for what’s in your glass, with no automatic gratuity of up to 18 per cent on top. Luxury lines, such as Uniworld, Scenic, Crystal and Tauck offer even more, with all-inclusive itineraries covering unlimited drinks and crew tips at the end of the cruise. That means you can start the day with a buck’s fizz and finish it with a nightcap, without facing an eye-watering bar bill at the end. Once you’ve paid your fare, all you need is spending money for when you’re ashore – so budgeting for a river cruise is simplicity itself. Q: Are you expected to dress up on a river cruise? I don’t mind too much, but my husband hates having to put on his best bib and tucker, especially when we’re on holiday. A: Relax, you can leave the ballgown and tux at home. River cruises are much more laid back than their oceangoing counterparts and you won’t find a formal dress code, let alone a black tie night. There’s usually a captain’s reception and gala dinner, where some people opt for a dressier look, but it’s not obligatory and your husband would be fine in a smart shirt and trousers (no need for a jacket and tie). At dinner most guests opt for smart casual (ie no jeans, shorts or T-shirts) but daytime wear is whatever you’re comfortable in. The most important packing tip for a river cruise is to take layers to cope with unpredictable weather, plus comfortable shoes or trainers, as many shore tours involve walking on cobblestones and uneven surfaces. Q: I have a significant birthday coming up. I’ll celebrate at home with my husband and family but then I’d like to go away with a group of girlfriends. We fancy a river cruise and we all love our food and drink. Any ideas? A: Firstly, congratulations! A river cruise is a great holiday for a gang of like-minded friends, and you’ll be happy to know that most companies offer discounts for groups of around eight or more. There are several themed food and wine cruises, such as CroisiEurope’s four-day gourmet sailing along the Rhine through Germany’s wine-growing heartland (being a French-owned company, Croisi also know a thing or two about food). AmaWaterways, the only river line that’s a member of the prestigious culinary organisation La Chaine des Rotisseurs, runs week-long wine-appreciation cruises with on-board experts in France, Germany and Portugal. If you really want to push the boat out, you could exclusively charter European Waterways’ eight-passenger hotel barge, Finesse, which sails through Burgundy with a personal chef. Alternatively, there are private dining rooms on Uniworld’s brand new Seine ship, Joie de Vivre, and Crystal River Cruise’s Crystal Mozart, which sails on the Danube. Both venues serve amazing tasting menus, available at extra cost, and on Joie de Vivre this is combined with a cookery lesson. So you could book a very special evening on the date of your birthday. Cheers! Q: My partner and I are planning our first river trip but we’re used to the cabins on cruise ships. Will we find the accommodation cramped? A: River cabins aren’t huge, particularly on European vessels whose size is restricted in order to fit into locks and beneath low bridges. But standard cabins are perfectly comfortable for two, and you’ll find plenty of home comforts, including hotel-style beds, a bathroom with walk-in shower, TV, hairdryer, dressing table and sometimes a minibar and settee. Cabins are always cleverly designed with plenty of storage, including room to stow suitcases under the bed, so you can keep everything neat and shipshape. The majority have panoramic floor-to-ceiling windows and French balconies – for looking out rather than stepping out – though some have verandas with a table and chairs. Waterline or “duck view” cabins on the lower deck have windows set high in the wall that don’t open but still provide plenty of light. Most ships have several suites, offering more space, while all Viking’s Longships include a pair of two-room, 445sq ft Explorer Suites with a wraparound balcony. The swankiest accommodation is to be found on Crystal River Cruises’ supersize, 75ft-wide Crystal Mozart, which is restricted to sailing between Passau and the Black Sea where there are no narrow locks. These two-bedroom Crystal Suites measure a whopping 860sq ft and sleep up to five. Q: We went on an ocean cruise and had to sit with the same people at dinner each night. Would it be the same on a river cruise? A: No, river cruise lines operate an open- seating arrangement with no pre-assigned tables. The only exceptions are Amadeus and CroisiEurope, which tend to attract a wider range of passengers from different countries so you’re likely to be seated with fellow English-speakers and allocated the same table for the entire cruise. On other lines it’s simply a case of turning up at mealtimes and deciding where you want to sit. There’s always plenty of choice, particularly during breakfast and lunch when you can go in at any time during the opening hours. So if the ship is moored, you can head for the more scenic side overlooking the river. Dinner is usually served at a fixed time, with a little more leeway on lines including Uniworld Boutique River Cruise Collection, Crystal and A-Rosa that offer flexible dining. Tables for two are a rarity on river cruises, and you’ll probably end up sharing with up to six others, but you can choose to sit with different people each day so there is no danger of getting “stuck”. That said, I guarantee that you’ll meet plenty of new and likeminded friends, and towards the end of the cruise you’ll want to continue sharing a table with them. Q: My parents love river cruising and keep suggesting I should try it too. I can see it’s great for their generation but I’m only 26 – isn’t that way too young? A: It’s fair to say that the majority of guests on river cruises are 55-plus, but that could all be about to change. While many lines offer itineraries designed to appeal to more active travellers, with bike rides, hikes and so forth, Uniworld is the first to introduce cruises aimed specifically at the younger market. Launching next year, their U by Uniworld brand will feature two of their existing ships, River Ambassador and River Baroness, but repainted in all-black livery and re- named simply The A and The B. Following an extensive makeover, there will be new “studio” cabins that can accommodate up to three friends, plus special room-share rates and single cabins for solo travellers. Dining will be casual, with tapas-style dishes for sharing, plus on-board mixologists and international DJs. The ships will sail eight-day itineraries on the Rhine, Main, Danube and Seine, with overnight stops and longer stays in cities including Paris, Vienna, Amsterdam and Budapest. Shore trips will include white-water rafting, clubbing in Amsterdam and exploring the “ruin” bars inside abandoned buildings in Budapest. Q: We’ve been on several river cruises on the Rhine and Danube and fancy somewhere else in Europe. What do you suggest? I’d definitely recommend Portugal’s Douro, known as the River of Gold. It’s totally different from the Rhine and Danube, which have always been important trading routes with large cities and towns growing up on their banks. Naturally wild and turbulent, the Douro remained untamed until the 20th century, when dams were built to regulate the flow. Consequently, the riverside is still unspoiled – a dramatic green landscape dotted with vineyards. There is only one itinerary on the Douro; a 130-mile seven-night trip from the Atlantic city of Porto to Vega de Terron on the Spanish border, from where you can visit Salamanca. Vessels then have to turn back as the river is no longer navigable. Sightseeing highlights include UNESCO-listed Porto (illustrated below), where you can take a trip on a traditional rabelo, the wooden vessels that once carried port. From Regua there’s an excursion to Lamego, where the 18th century Sanctuary of Our Lady of Remedies perches above an ornate 686-step baroque staircase. And of course, with port being the national drink you’ll have plenty of opportunity to taste it on visits to some of the famous port houses. Unlike the rivers you’ve already sailed on, no night-time navigation is permitted on the Douro, which means you don’t miss out on any of the passing scenery. Also, Douro river ships are smaller, creating a very intimate onboard atmosphere. 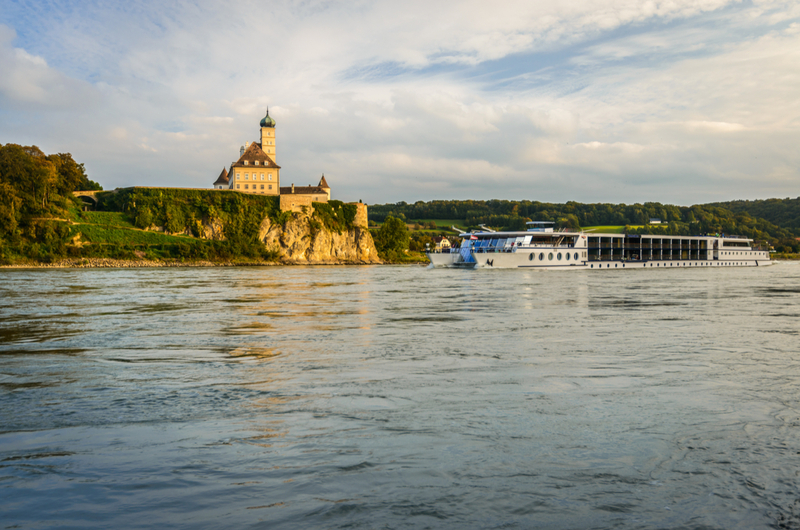 Q: Are river cruises suitable for passengers with disabilities? I would like to take my 81-year-old mother but would we be able to manage with a wheelchair? River cruises are suitable for wheelchair users, within certain limits. All modern ships have lifts between cabin decks, but only Uniworld and Vantage have hydraulic chairs to get to the sun deck. All of CroisiEurope’s premium-rated ships offer accessible cabins with wide doors and equipment for passengers with mobility issues. Similarly, AmaWaterways’ newest vessels have cabins with slightly wider doors and modified bathrooms that allow wheelchair access. Accessible cabins can also be found on some A-Rosa, Emerald – Waterways and Scenic ships. The main issue is getting on and off the ship. All lines state that wheelchair users must be accompanied by an able-bodied companion, and crew members will always help wheelchair users go up and down the ramp. However, problems can arise when ships moor next to each other in busy ports, usually on the Danube and Rhine, which require passengers to cross the sun deck of the adjoining ship before getting off. Unfortunately, the lines have no control over when this might happen. Once off the ship, the majority of walking tours are conducted at a slow pace. And with ships mooring in the heart of towns and villages it’s also easy for people to explore by themselves. I was on an Amadeus Rhine cruise last year with a gentleman in a wheelchair accompanied by his son, and they had such a good time that they’ve booked a second trip for this year. So forewarned and forearmed, you and your mother could have an equally enjoyable holiday. Q: I’m a solo traveller and all too familiar with the dreaded single supplement. River cruises seem to be a good travel option for singles, but will I have to pay double just because I choose to go alone? You’re quite right – river ships are very sociable, with open-plan seating at meals, so you quickly get to meet people. And yes, single supplements are deeply unfair. Happily though, river companies are starting to realise that independent travellers don’t like feeling ripped off. European Waterways, for example, is waiving the single supplement on many of its luxury hotel barge cruises for the remainder of the 2017 season, including cruises in France and Italy as well as on its newest vessel, Spirit of Scotland, which made its debut in the Scottish Highlands in June. If you fancy more exotic climes, Pandaw is offering supplement-free cruises on a wide range of itineraries up until 2019. These include cruises in northern Vietnam along the Red River and off the beaten track on the Duong and Black Rivers, and the Irrawaddy in Myanmar (Burma). Also keep an eye on the websites of Emerald, AmaWaterways, Scenic, A-Rosa, Tauck, Avalon and Uniworld, all of which waive or reduce single supplements on selected cruises.